So all day I was thinking about what to make for a blog post since my Ravioli Nudi was a complete fail and I didn’t have the heart to attempt another Italian dish. I knew I should also figure out a way to incorporate the sweet potatoes, fennel and Spicy Bits that were slowly coming to the end of their life in my kitchen. Opting for something with a Mexican, spicy, cheesy flair this it what was created. Felipe and myself couldn’t get enough but the little vegan decided it was too spicy for her palate. The left over Pepper Cheesy Sauce was a dip loved at my work by vegan’s and dairy eaters alike. On a side note, the Spicy Bits could easily be replaced with black beans to make this a gluten free meal. Also, it would make preparation easier if you made Pepper Cheesy Sauce before starting steps below. Preheat oven to 375 degrees. In a 9″ pie dish press in one chub of Polenta to resemble pie crust and bake for 30 minutes. Boil sweet potatoes until tender. Drain and mash sweet potatoes until smooth, adding smoked paprika, cumin and 1/4 cup Pepper Cheesy Sauce. Saute bell pepper, spinach and artichokes in olive oil until bell pepper is tender. 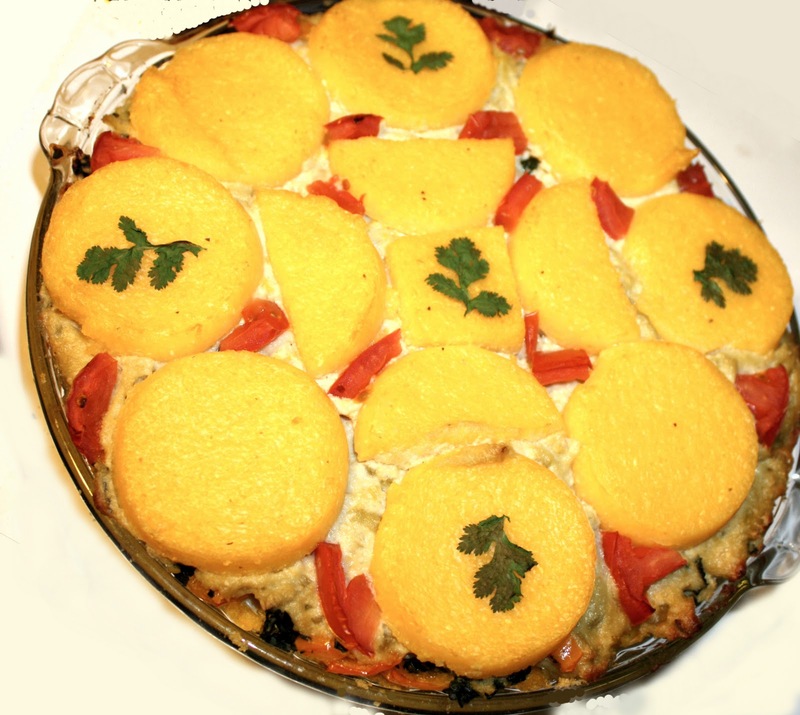 Once Polenta pie has baked for 30 minutes spread the mashed sweet potatoes over the top. Next layer the following ingredients starting with Spicy Bits, spinach mixture, 1 1/4 cup Pepper Cheesy Sauce and then decorate top with Polenta rings. Decorate top with cilantro and tomatoes if you like. Bake at 375 degrees for 45 minutes. Recommend serving with sour cream, salsa and cilantro. *Spicy Bits may be substituted with protein of choice. Gallery | This entry was posted in Gluten Free, Main Course. Bookmark the permalink.